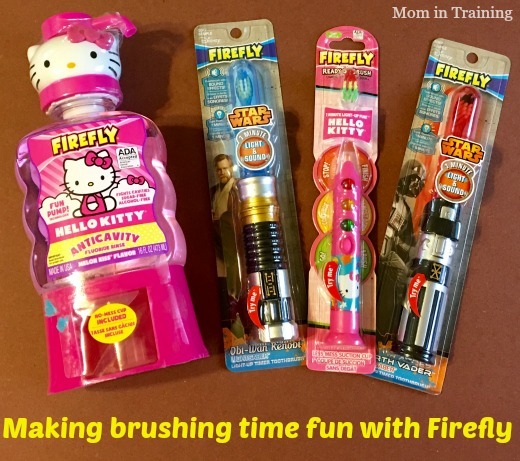 Stacy Tilton Reviews: Fill their stockings with Firefly and make brushing time fun! Fill their stockings with Firefly and make brushing time fun! I know when I was growing up we always got a new toothbrush in our stocking. It actually was something I looked forward to because it was usually a special one with some sort of character I liked on it. I thought it was cool because other than that I always had the plain one from the dentist office that was just a solid color. So when I had my own kids I too decided to put a fun toothbrush in their stocking and kept the tradition going. This year my kids will be really excited because they will not only be getting a character toothbrush they'll be getting a Firefly toothbrush that lights up too! Every Firefly toothbrush is equipped with a 60-second light-up timer that helps teach kids to brush for the dentist recommended time of one minute for each row of teeth. This is great because I'm always battling with my daughter about how long she has brushed. She says she is watching the clock, but I know she doesn't always make the full two minutes. Now I will know if she tops early because her toothbrush will "tell" on her. Firefly toothbrushes are available in popular characters such as Hello Kitty, Marvel, Barbie, Angry Birds and many others that kids love! Firefly also recently launched a brand new Star Wars Lightsaber toothbrush that features character voices, flashing lights and galactic sounds to encourage kids to defeat the dark side of cavities! Buy it: You can purchase Firefly products in store and online. Check out the store locator online to fine a retailer near you.